In between fussing about my students, I thought I'd walk back into the past two months and write about some of that stuff I would have been writing about, if I were here, which I wasn't. One of the reasons I wasn't here was that my husband and I were driving across Alaska. Not the whole thing. We only had 10 days. Alaska's big. 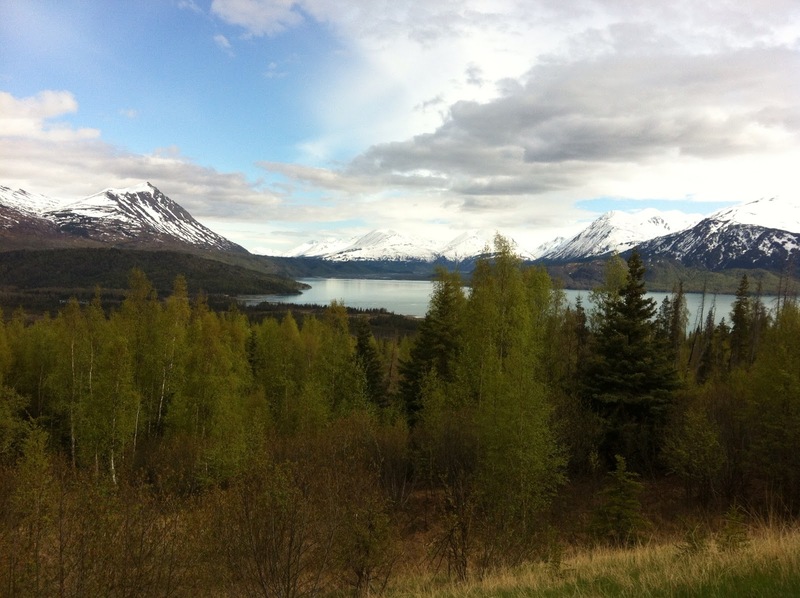 We drove the Kenai Peninsula, from Anchorage to Seward, Seward to Homer and back again. That's pretty much all the paved road there is up there. We hit it all. And a lot of unpaved road, too. The unpaved road is where they keep the loons. But that is a story for another day. Today's story is about a river, and the Place Where the World Ends, and Aslan's Country begins. Our third day in Alaska, we were signed up with Alaska Wildland Adventures to raft the upper 17 miles of the Kenai River. 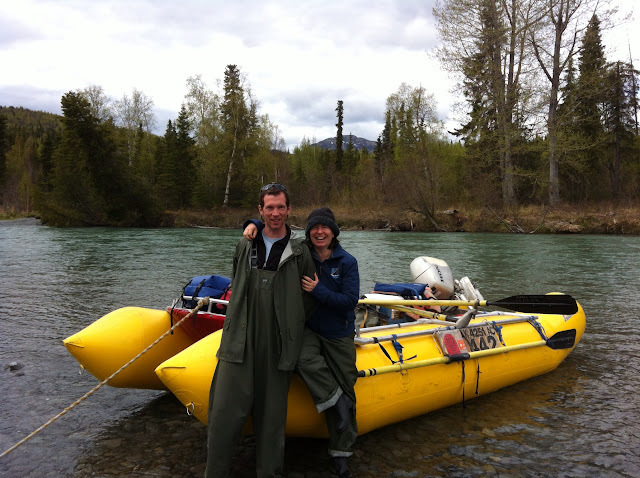 It was billed as a calm and scenic float tour with wildlife viewing opportunities and a few class II rapids. Memorial Day Weekend had not started and the salmon fishing season was still three weeks off, so as it turned out, we were the only two people on the raft, besides the guide. And in fact, over 8 hours on the river, we only saw (and very briefly as we passed it) one other boat. The entire day it was only my husband, our guide Justin, and myself, in the middle of nowhere on this untouched, undammed river with water so white-blue it looked like a flowing glacier. 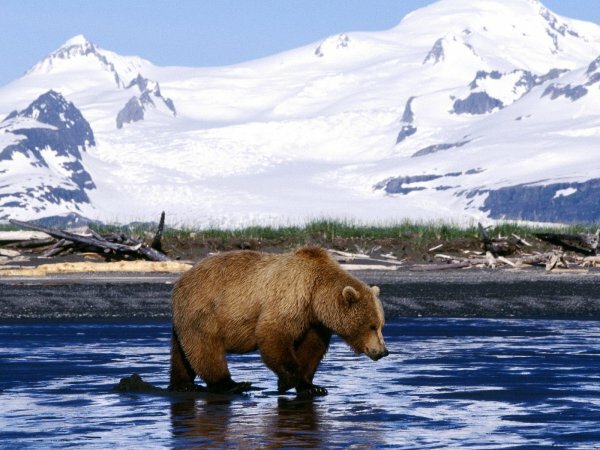 What I wanted, more than anything, to see in Alaska was a brown bear (grizzly). But from everything I'd been told, there was a next-to-nil chance in the areas we planned to travel. The only way to be sure to see browns this early in the year is to take a plane ride daytrip to a place called Katmai, for the low low price of $650 each. There's a beach there, where the bears go clamming at low tide. Lots and lots and lots of grizzlies, all digging for clams. Did you know bears eat clams at low tide? Neither did I. That would be amazing to see. If you have an extra $650 and you're in Alaska, you should do that. Where we were, however, we were told that brown bears come down to the river out of the mountains when either the moose start calving or the salmon start running, and our timing was off. So I hoped, for my river trip, to see some new birds, and perhaps a moose. Mostly I just wanted to enjoy a day on the water, and get some paddling in. It was delightful to find we needn't share our raft with strangers. It was very unnerving, but extremely pampered-feeling, to find that Justin was fully prepared not only to paddle us by himself with no help the ENTIRE 17 miles (in fact, he flat out refused to let us paddle), but also to entertain us, or not, as we liked, with a steady stream of fascinating knowledge about the local wildlife species, cultural archeology, and hysterical stories of Alaska's "combat fishing." It was a gorgeous place to be. Freezing, but Justin had a bag full of extra warm clothing, so I fitted myself into a russian fur hat and a pair of mittens, and all was well. Eagles, harlequin ducks, mergansers, eagle nests around every corner. Justin knew every one. He showed us dipper nests hidden behind waterfalls and beaver lodges hidden in the river bank. 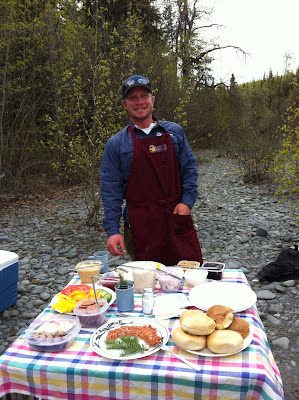 Justin making lunch for two on the river bank. Yes, that's definitely smoked salmon. And then, as he rowed us past a bend in the river, in the middle of a Justin story about how cottonwood trees deliberately cause wildfires to thin out the other, more flammable trees in the forest and make room for themselves (tree warfare! ), I looked back at the bend we'd just past, and standing there, maybe 15 yards from us but ignoring us completely, was the largest and most gorgeous bear I have ever seen in my life. He was about 6 - 700 pounds, the exact color of honey, and he was nosing around the edge of the river as if to check and see if the salmon had shown up. and here's the kicker: I didn't have a camera. I had charged the battery the night before but forgotten to put it back in. All we had was Nathan's iphone, and the river whisked us away too quickly for it to have been any use. Here's a bear photo linked from the above mentioned Alaska Bear Adventures that is somewhat close, but my bear was a deeper, richer caramel color and he was standing on a forested river bank, not a grassy one. It was probably the best 120 seconds of our trip. It was amazing. I'm still in disbelief that we were that close to a 600+ pound grizzly - we passed within feet of him before we even saw him. He didn't even look at us, just ambled at the river bank, peering into the waters, looking for early salmon. We spent the rest of the day lazily eating and chatting and relaxing, until we emerged from the river into a huge lake, 13 miles across. Here the arctic terns gathered at the mouth of the river by the hundreds, helping themselves to any fish moving upstream and into the river, and after we drifted past them we were out in the lake proper and the river current was gone and the motor turned on. 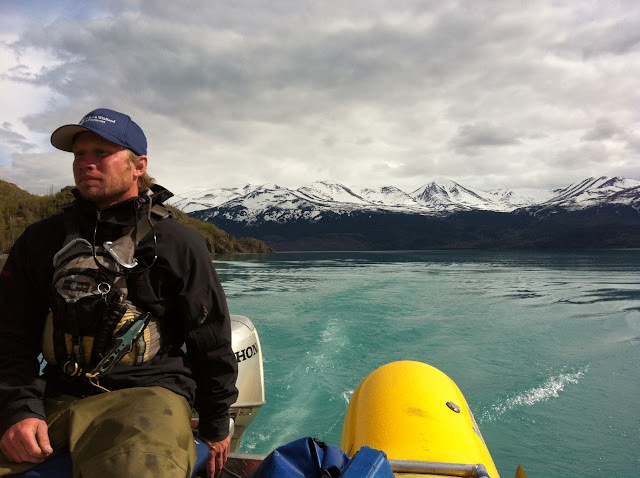 It was an immensely calm day and the lake was like glass, with the snow covered mountains rising up above the forests all around, and glaciers sliding down their sides, and we motored on, the only boat in existence, for about 40 minutes. it took my breath away. The water went on like glass to the end of the world. And at the end of the world was a tiny, barely visible strip of land. And beyond that land was a mountain range, 75 miles away and literally across the ocean. You can barely see in the photo below, a faint, lavendar, snow covered peak, at about the left third of the photo, behind the dark mound of shoreline. That peak is Mt. Redoubt, a huge and quite active volcano. Chapter 16, Voyage of the Dawn Treader, the 5th book of the Narnia series. The ship has been sailing east for months, and we are nearing the end of the story, and they have chosen to go forward instead of back to see what might come. "...after that for many days, without wind in her shrouds or foam in her bows, across a waveless sea, the Dawn Treader glided smoothly east. Every day and every hour the light became more brilliant and still they could bear it...they drew buckets of dazzling water from the sea, stronger than wine and somehow wetter, more liquid than ordinary water. Everyone on board was filled with joy and excitement, but not an excitement that made one talk. The further they sailed, the less they spoke, and then almost in a whisper. The stillness of the last sea laid hold on them. ... But now they could look at the rising sun and see it clearly and see things beyond it. What they saw - eastward, beyond the sun - was a range of mountains. It was so high that either they never saw the top of it or they forgot it. ... No one on that boat doubted that they were seeing beyond the end of the world into Aslan's country. ... And of course, as it always does in a perfectly flat place without trees, it looked as if the sky came down to meet them. But as they went on, they got the strangest impression that here at last the sky did really come down and join the earth - a blue wall, very bright, but real and solid: more like glass than anything else." That is exactly what we saw, and exactly how we felt. I have never been so physically stunned by any scene. The end of the world, and beyond it, Aslan's country. Expect 5 more weeks of my head pounding the wall. Is it ok to say if a Chinese man says it? ?